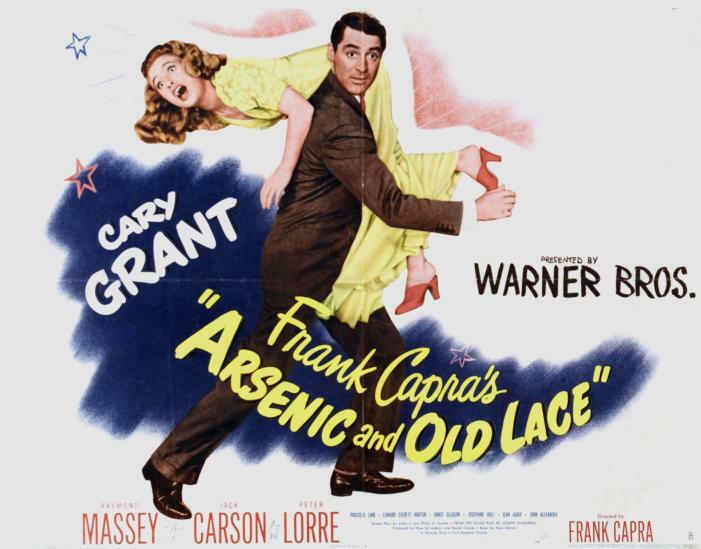 Mortimer Brewster (Cary Grant) is a critic of Broadway plays who has finally been hooked by his longtime-girlfriend, Elaine (Priscilla Lane). They have a quickie marriage at Town Hall and come home to pack for their honeymoon. Mortimer lives with his aunts, a couple of adorable old maids named Abby and Martha (Josephine Hull and Jean Adair), and his insane cousin, who believes he is Teddy Roosevelt – yes, President Teddy Roosevelt (John Alexander). They are absolutely thrilled that Mortimer and Elaine have finally tied the knot. They want to throw Mortimer and Elaine a wedding dinner before they leave for (where else?) Niagara Falls. While Mortimer is helping them prepare, he finds the shock of his life – a dead body in the window seat. Turns out, his aunts killed the elderly man in the window seat. In fact, they’ve killed almost a dozen. They’re practically on a spree. It all started when an elderly man came by to look into renting their upstairs bedroom. While he was visiting, he had a heart attack and died. He had told the ladies he had no family, no children or anyone to miss him. And he looked so peaceful in death, they were inspired. There must be hundreds of sad, lonely old men out there just wandering around waiting for life to end. They could help put them out of their misery! Mortimer is dumbfounded. All thoughts of honeymooning leave his mind as he becomes terrified that his sweet, unassuming aunts will be found out and exposed, and while he knows what they did was wrong, he can’t bear the thought of his quaint little aunts spending the rest of their days in prison. To complicate matters, they are on a first-name basis with the beat cop in their neighborhood. And Mortimer is slightly hysterical, saddled with this new information. 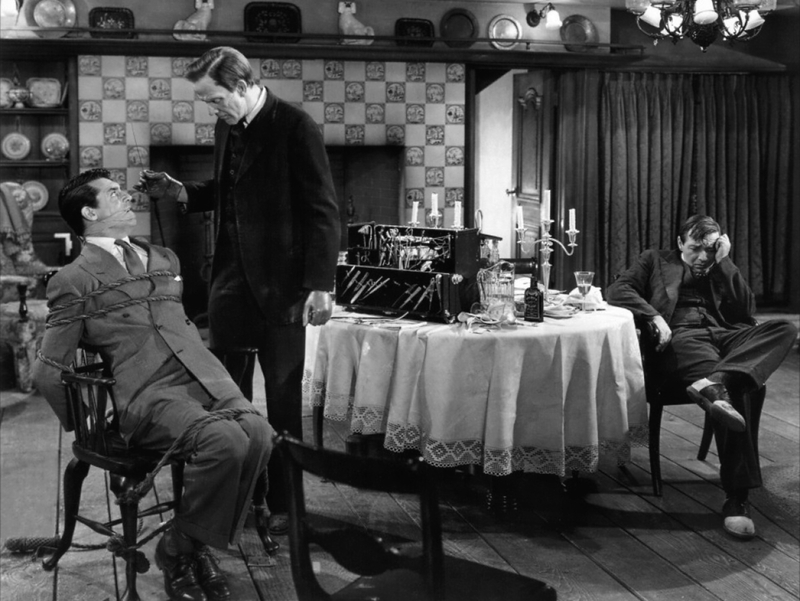 While he’s working feverishly on a scheme to cover up his aunt’s nasty hobby, another twist – his long-lost sadistic brother, Jonathan (Raymond Massey) has returned home with a mysterious companion (Peter Lorre) and a dead body of their own. Mortimer learns about Jonathan’s victim, and Jonathan learns about his aunts’ collection. The hounds begin to circle until Mortimer finds himself caught between snoopy cops and a serial-killer for a brother determined to secure his silence. Oh, by the way, this is a comedy. I laugh-out-loud comedy. 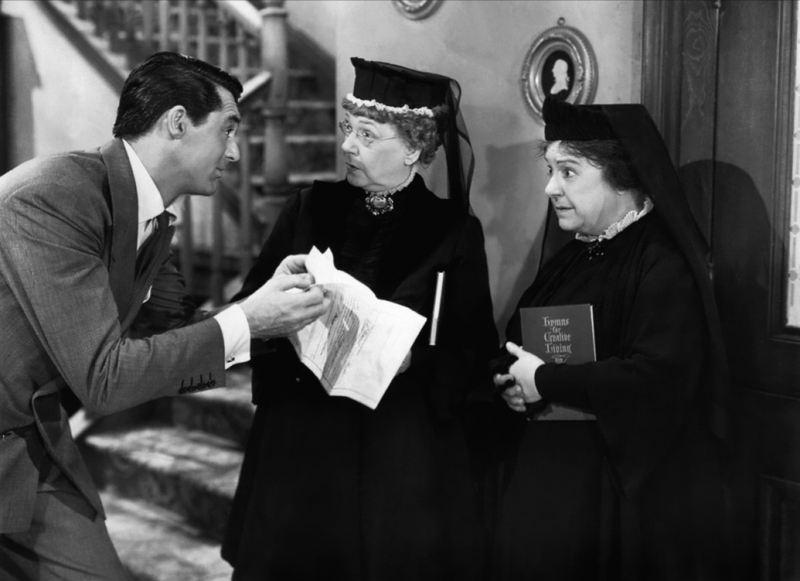 Perhaps my favorite of Cary Grant’s comedies. And I can never get enough of Priscilla Lane. She had a brief but fantastic career. Blonde, adorable, intelligent, emotional. She’s a delight to watch. Josephine Hull and Jean Adair are absolutely fantastic. They played the same roles on Broadway to rave reviews, and no wonder. You really can’t imagine anyone else in the roles. I played Elaine in high school when we did this play. SO funny! I LOVE this movie! It's one of my favorites.